Are there nail polish colors you used to wear a lot of but you don't wear much anymore? When I first got into nail polish I really loved pinks and reds. Now, I really don't wear them that much. I think pinks and reds are definitely colors that are hard to impress because there are only so many shades of red and pink. Pinks and reds are also the most classic and timeless nail polish colors, so they've been around a long time. It really takes a good pink to impress me these days, and I found that in OPI Suzi's Hungary Again! Suzi's Hungary Again! 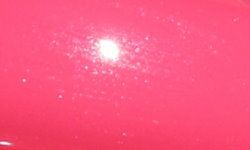 is a warm medium pink with a subtle silvery shimmer. This one is from the recent Spring 2013 OPI Euro Centrale collection. I think why this stands out to me is a warm pink. I find that warmer pinks are rarer than cool pinks especially in the case of a spring collection. This is bright and vibrant without being neon or in your face. I love this pink, and it's definitely one of those nail polish colors I think would look lovely on most. The formula on this was nothing to sing home about. The formula wasn't horrible nor was it great. I've had worse and I've had better. It was a little streaky and thick. The polish evened nicely in the end, but I'd really expect better from an OPI polish. This color looks so happy on you! But, I prefer cooler toned shades of pink on me, they tend to look better. Your swatch of this looks absolutely fabulous! I didn't pick this one up because the bottle just didn't scream at me but the more and more swatches I see of it, I really like it! I love these kinds of colors for my pedicures. Your swatches are always so immaculate.